Saying thank you to the people who help take care of your kids when they’re headed off to school or at school is very important, but it can also be costly. Fortunately, there is a way to offer a heartfelt thank you without breaking the bank. 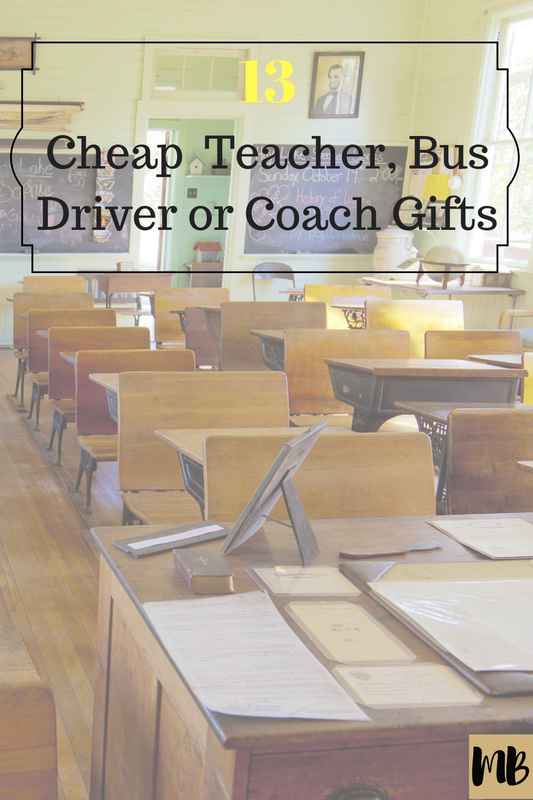 Here are the best cheap teacher, bus driver or coach holiday gifts. This one is filled with appreciation and thoughtfulness. Real Hansen Home has the easy to print stickers for the candy bars. If you’re looking for the bars, you can find the Kit Kat here on Amazon and the Skor here on Amazon. I like this one because there are a lot of germs floating around during the holiday season. Simply Being Mommy suggests you stop by Bath and Body Works, get some soap or hand sanitizer and then attach a nice card. Let’s face it, teachers, bus drivers, and coaches all love gift cards. In the season of giving, why not give them what they love? You can buy Starbucks cards in bulk here on Amazon. Or if you want something a little different, try buying a gift card to a local school supply store. This one is a little more costly to make, but it’s definitely appreciated. By Stephanie Lynn shows you how to make the cake that’s a lot like the diaper cake you find at a baby shower. You can find crayons here on Amazon, glue sticks here on Amazon and markers here on Amazon. This is a great suggestion from the Stretching a Buck Blog, take a reusable cup (you can find one here on Etsy) and then fill it with candy. Add a tag and you’re ready to go! 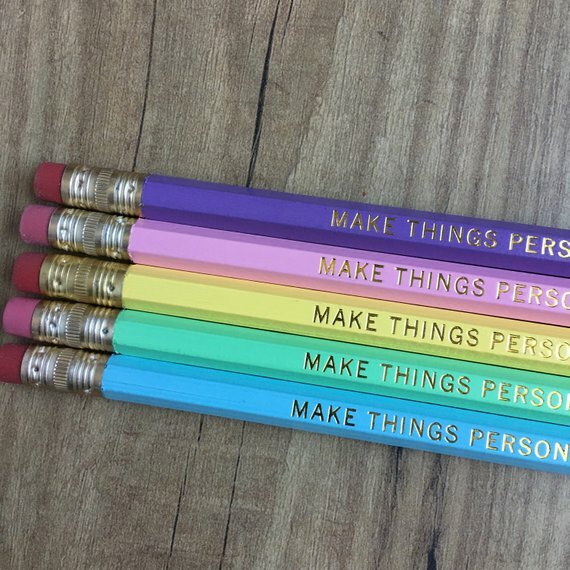 Buzz Feed polled teachers to find out the best gifts they’ve ever received and towards the top of the list was personalized pencils. According to the teachers, they’re the only pencils they’re likely to get back at the end of the day. You can find some here on Etsy. 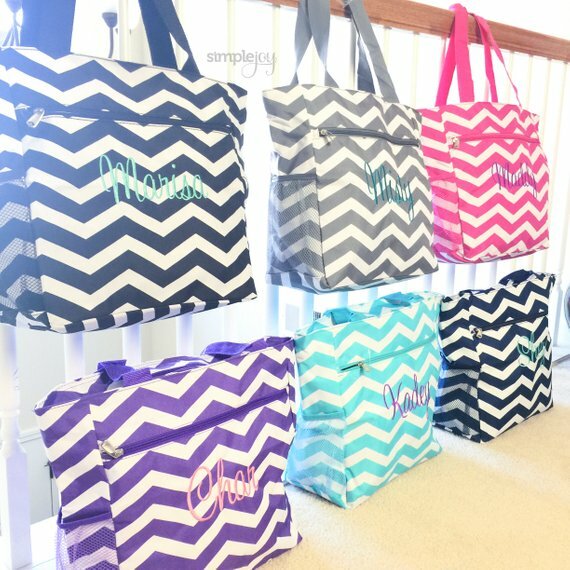 Another great suggestion from the Buzz Feed teacher poll, a giant tote bag. Respondents say it’s the best way to carry things to and from school every day. You can find these here on Etsy. 71 Toes came up with this cute and original gift, though it’s a little punny. It works for coaches, teachers or bus drivers which is a huge plus. And, it’s not super expensive to make. You can find takeout containers here on Amazon and fortune cookies here on Amazon. This was an end of the year gift made by Tiny Oranges, but it works just as well as a holiday gift. You can find some succulents at your local hardware store. If you’re looking for a cute pot, try this one on Amazon. This one is courtesy of the site Hey Teach! A lot of teachers love a personal and heartfelt note from their students. Consider sitting your kids down for an hour or two so they can get to work. This is a dual purpose gift. Fantastic, Fun and Learning shows you how to make a Sharpie Flower Vase. You can find Sharpies here on Amazon. May we suggest a trip to your local farmer’s market for the flowers. According to Bombshell Bling, who is a teacher herself, homemade goodies are a great gift. She can share them or keep them all to herself. No judgment here. This one is free if you have the time. The Measured Mom reminds you that your time is perhaps one of the greatest gifts you can give a teacher. Offering to make copies after school, staple homework packets together or something else that takes a little work off his or her plate. What do you think the best teacher, coach or bus driver holiday gifts are this year?